Mr Chavez said there had been mistakes in introducing rolling blackouts in the capital, and people did not know when their neighbourhoods would be affected. Venezuela has been hit by unplanned power cuts which the government blames on a drought hitting hydro-electricity. The opposition accuse the government of failing to invest in infrastructure. The government announced this week that the entire country would be affected by energy rationing, with rolling blackouts in different areas on different days. 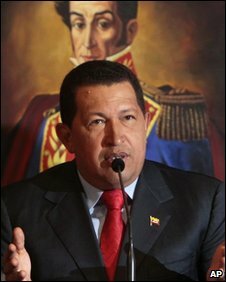 Announcing his decision to suspend the move in Caracas, Mr Chavez said there had been mistakes with power cuts happening at the wrong time in the wrong sectors of the city. "We're going to continue to apply a rigorous energy saving plan," President Chavez said. "But in Caracas the government recognises that there have been technical mistakes and poorly taken decisions." Mr Chavez said he had ordered a review of the process but it was not clear when the authorities would try to reintroduce the measure in the capital. He also announced that he had sacked the electrical energy minister, Angel Rodriguez, who, he said, had accepted the decision "like a soldier". The reversal of the rationing is undoubtedly an embarrassment for Mr Chavez's government and for the president personally, says the BBC's Will Grant in Caracas. Many customers in Venezuela are angry that one of the world's largest oil producers should be suffering such blackouts. Ministers say the problem has been caused by critically low levels of water at the country's main hydro-electric dam, which meets around 70% of the country's domestic energy needs. The interior of Venezuela has been experiencing electricity cuts for some time, and recently Mr Chavez advised people to spend no more than three minutes in the shower to conserve water and electricity. State television now features regular advice on how to brush your teeth without wasting water and reminders to switch off air conditioning and lights. In another move, the government has taken over more than 200 businesses accused of illegally benefitting from a recent devaluation of the currency, the bolivar. 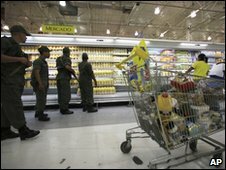 The biggest chain affected so far is the French-owned hypermarket, Exito, whose main stores in Caracas and other big cities were closed on Tuesday by the national guard. The bolivar's official exchange rate, which is set by government decree, had been held steady at 2.15 to the US dollar since the last devaluation in March 2005. Last Friday, President Chavez announced that it would now have two rates - 2.60 to dollar for "priority" imports, and 4.30 to the dollar for other items considered non-essential - a 50% devaluation. There is still confusion over how the dual exchange rate is actually supposed to work in practice, our correspondent says.